Great texture and spicy sweet taste. These Chai cookies were created when I was craving to recreate the taste of Chai tea. They are easy and fun to make, and best of all, vegan! Great for kids or adults alike who would like a sweet treat that doesn't contain allergens like dairy or eggs. Preheat oven to 350F (180C). Grease several cookie sheets with nonstick spray. Mix butter and sugar until creamy. Add in flour, spices and salt. Roll into desired sized balls (I like to do 1 or 2 tablespoon-sized balls). Space out on the sheet and bake 12-15 minutes or until golden. 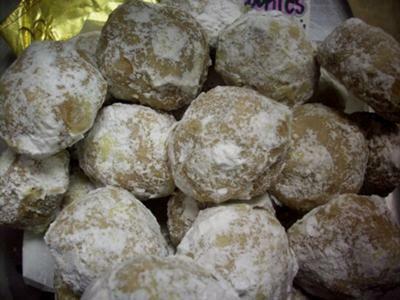 Let cool on the sheets for 5 minutes, then roll each ball in powdered sugar. I am going to use real butter (rather than non-dairy butter) to make these cookies...but I'm not sure how much to use. (We don't use "sticks" of butter as a measurement in Australia). cookies does this recipe make? ?